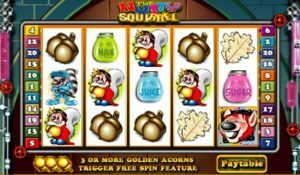 What Is the Slots Squirrel System? Many players enjoy trying an interesting slots strategy from time to time. And the slots squirrel system is definitely one of the most-unique strategies. Keep reading as I cover how to use the squirrel strategy along with if it can help you out in any way. The slots squirrel strategy can be used with a variety of alterations, including switching machines and setting a stop-loss limit. But backbone of this system involves setting aside a percentage of your winnings when you reach a certain point. The percentage of winnings that you “store” can vary based on your personal preference. But many people set aside half of their winnings if they manage to double their initial starting bankroll. If you start with $1,000, for example, you’d need to reach $2,000 to double up. At this point, you would take $1,000 and store it for another session. You can actually do whatever you like with the extra amount after doubling your bankroll. But I personally like to use it for a later date. The problem with the slots squirrel system is that it’s hard to double your money. These are unpredictable games that make it difficult to double your total in any given session. The most-likely case is that you’ll start in the hole and be trying to dig your way back to even. This is where the aforementioned stop-loss limit comes into play. Assuming you start out with $1,000, you can set a stop-loss limit for either $750 or $500. This is another area where personal preference comes into play. Despite the squirrel system’s shortcomings, you can still see that this is an interesting strategy to use if you’re tired of the same old drill. That said, give the squirrel system a try for a session or two. ← Royals Slots Symbols: What Are They?